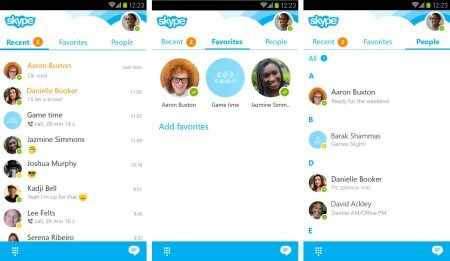 Skype 5.10 for Android update brings custom ringtones and photo sharing between conversations. Skype for Android has received an update today, bringing personalized ringtones and the ability to forward photos from your chats to other Skype users. Customize incoming call sounds for a contact by selecting a ringtone from your device. In a conversation, tap the lower right and select "Ringtone options" then "Set custom ringtone". Share photos from chats with other Skype friends and family who may not be in the conversation. Just tap and hold on the photo you want to share and select "Forward photo". Skype have also included a number of fixes and additional improvements, including changing the colors of avatars for group chats so you can easily tell one conversation from another. + Choose from a variety of LINE stickers to express a wider range of emotions. + Send photos and even large files over 1GB quickly and easily. + Organize your groups in a separate list. 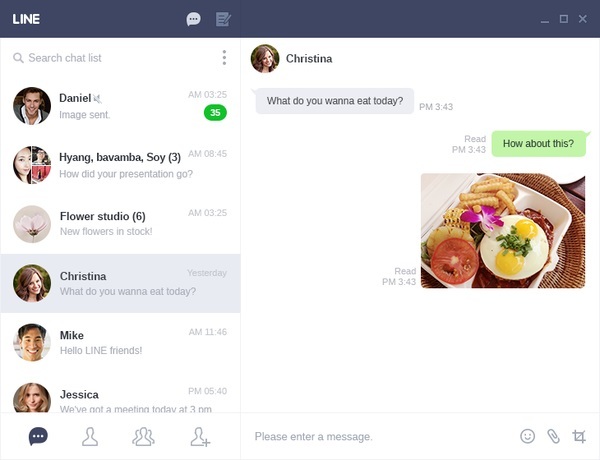 + Create groups with your family, school friends, and other close friends. + Never lose your ideas. Keep and organize important information easily. + A picture is worth a thousand words: add pictures to your memos to enhance them. 3DMark for Android update adds Sling Shot, a new benchmark test for OpenGL ES 3.1 and ES 3.0. Futuremark today released a major update for 3DMark that adds new benchmark tests for compatible Android smartphones and tablets. 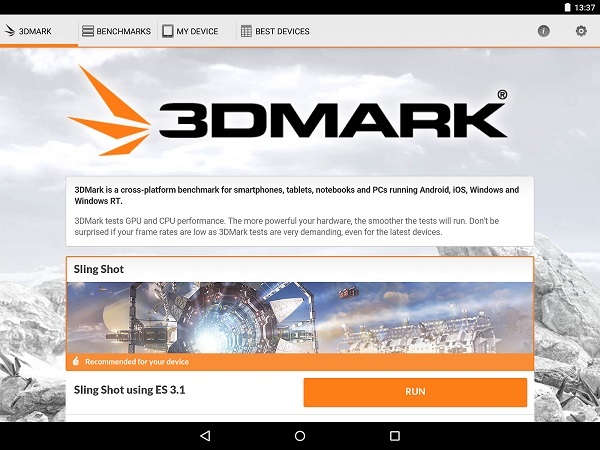 3DMark Sling Shot is an advanced 3D graphics benchmark for smartphones and tablets running Android 5.0 or later that support OpenGL ES 3.1 or ES 3.0. Run Sling Shot in OpenGL ES 3.1 mode to compare flagship Android devices from HTC, LG, OnePlus, Samsung, Sony, Xiaomi, and other leading manufacturers. Or choose OpenGL ES 3.0 mode to compare high-end Android devices with the latest iPhone and iPad models, (iOS version coming soon). Sling Shot tests the full range of OpenGL ES 3.1 and ES 3.0 API features including multiple render targets, instanced rendering, uniform buffers and transform feedback. The test also includes impressive volumetric lighting and post-processing effects - you've never seen graphics like this on smartphone before. When using ES 3.1, Sling Shot's Graphics tests are rendered at 2560 x 1440 then scaled to the device's display resolution. When using ES 3.0, the Graphics tests are rendered at 1920 x 1080 before scaling. In both cases, you can also choose to run the test "offscreen" using Unlimited mode. For more details, we recommend reading our 3DMark Technical Guide, which explains exactly what's being measured and how the scores are calculated. If you use 3DMark to test Windows PCs, you'll notice that Sling Shot looks similar to Cloud Gate. To create Sling Shot, the assets and rendering techniques used in Cloud Gate were modified to make them suitable for mobile hardware. In broad terms, Sling Shot is a lighter test than Cloud Gate. Even though they share content, they are separate tests. Sling Shot scores from mobile devices should not be compared with Cloud Gate scores from Windows PCs. New Sling Shot benchmark for testing OpenGL ES 3.1 and OpenGL ES 3.0 performance of compatible devices running Android 5.0 or later. New hardware monitoring chart shows how CPU clock frequency, CPU usage, temperature and battery charge changed while the benchmark was running. 3DMark now recommends the best benchmark for your device. Save storage space by installing only the benchmark tests you need. Improved UI makes choosing benchmarks easier. Android TV support lets you benchmark set-top boxes and smart TVs. Sling Shot now runs on ARM Mali GPUs. Note that this update completely replaces the standalone Sling Shot app released for limited testing in April. That app is no longer available from Google Play and should not be used for further testing since its scores are not comparable with this update. Want to show your friends what you saw on that 12-mile hike you took last weekend or let them experience how it felt to fly down the mountain on your recent ski trip? With Microsoft Hyperlapse, you can time lapse those experiences, distilling them into easily consumable, enjoyable experiences. Hyperlapse Mobile is for Android users who want to capture hyperlapses on the go. The mobile app allows you to save multiple speeds and share your videos through social networks or emails. 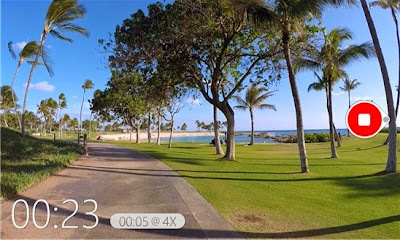 Microsoft Hyperlapse Mobile offers the chance to turn any long video - from a bumpy bicycle ride to a family stroll in the park - into a short, distilled version that you can easily share with friends and family. + Users capture video, and select a timelapse speed, resulting in a time lapse with a smoothly moving camera. + Import existing video from the phone's camera roll and hyperlapse it. + Microsoft Hyperlapse Mobile supports hyperlapsing a video multiple times, at different speed rates, from 1x to 32x. + Create selfie time lapses. + Simple and intuitive user interface make you an expert in seconds. Android 4.4 or higher (KitKat and Lollipop). Hyperlapse Mobile for Android beta supported devices. 'like' team messages and even reply using voice commands - directly on your smartwatch. It's never been easier to stay connected with your team, on the go. To get started, just install Yammer on your Android phone and Yammer is seamlessly extended to your Android Wear device. Interactive notifications: Engage with your team even faster by 'liking' posts directly from the redesigned Yammer notifications on your Android devices. Yammer have added many usability enhancements too - notifications roll up by threads, the Yammer icon appears on all notifications, and we even flash the LED on your Android phone to announce incoming notifications. Share into Yammer: Multiply your impact wherever you are by sharing links, photos and more into a Yammer group directly from Safari, Chrome and other apps. SMARTER NOTIFICATIONS - Push notifications on your phone go away if you read their messages elsewhere! ANDROID WEAR - Get notifications/messages & send replies with your voice, right from your smartwatch! Picturesque Lock Screen, a Microsoft Garage project, brings the beautiful Bing home page images to your android lock screen. The app allows you to easily change the image (from the past 6 days Bing homepages) with just a shake of the phone or by swiping to the right. Picturesque also brings your current weather, news and Indian regional calendars on your phone lock screen. Picturesque Lock Screen brings the beautiful Bing home page images to your Android lock screen. You could see your missed calls and text messages at a glance on the lock screen and also search directly from the lock screen without unlocking your phone. Picturesque Lock Screen also brings your current weather, news and regional calendars (only in India) on your phone lock screen. Beautiful Bing Homepage images: Your lock screen will be updated with the beautiful daily Bing image; you could swipe through the images from past 6 days or shake your phone to change the image on your lock screen. Search on the lock screen: You could search for anything on the web directly from the lock screen and read all the linked pages without having to unlock your phone. Latest news: Keep yourself updated with the latest news headlines and tap through to read the full articles. Weather: Find out what the weather is at your current location; long tap through on the icons to get the detailed weather predictions for the week. 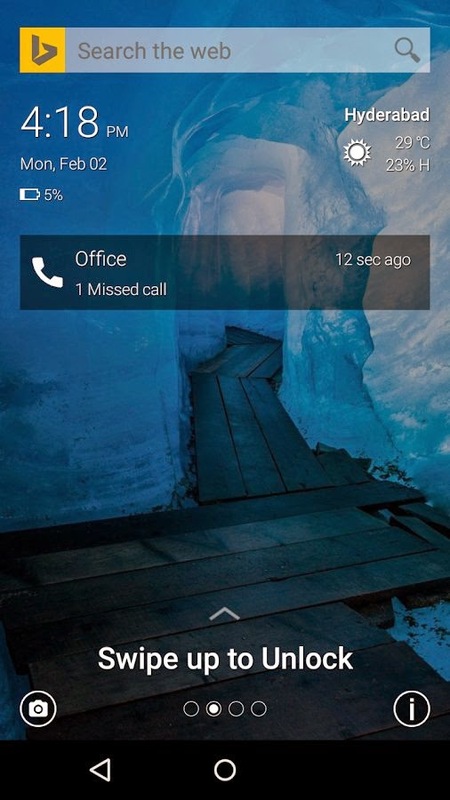 Notifications on Screen: See your missed calls and Messages quickly from your lockscreen. Quick call or reply from the notification from Home screen itself. Camera & Phone controls: Access your phone camera from the lock screen; Change your WiFi, Bluetooth, volume, brightness settings; also use your phone as a torch from the lock screen. Regional Calendars & Muhurats (Only for Indian users): Personalize the lock screen to access your favorite regional calendars and Muhurat. Now you can figure out what festival is on for the day, rahu kalam, chogadiya/hora timings all from the lock screen itself. + Beautiful Bing home page images: Shake to change the image on your lock screen. + Search: Search the web from your lock screen without unlocking the phone. + News: Keep yourself updated with the latest news headlines on your lock screen. + Regional calendars & Muhurtas: Personalize the lock screen to access your favorite regional calendar & almanac. + Weather: Learn about the current weather at your location. Tap through the weather icon to get the latest weather predictions. The official Microsoft Outlook app designed for Android. Outlook is a free email app that helps you get more done from anywhere with one unified view of your email, calendar, contacts, and attachments. Outlook works with Microsoft Exchange, Office 365, Outlook.com, iCloud, Gmail, and Yahoo Mail. Outlook automatically surfaces your most important messages - across all your email accounts. Swipe to quickly delete, archive, or schedule messages you want to handle later. Easily view your calendar, share available times, and schedule meetings. 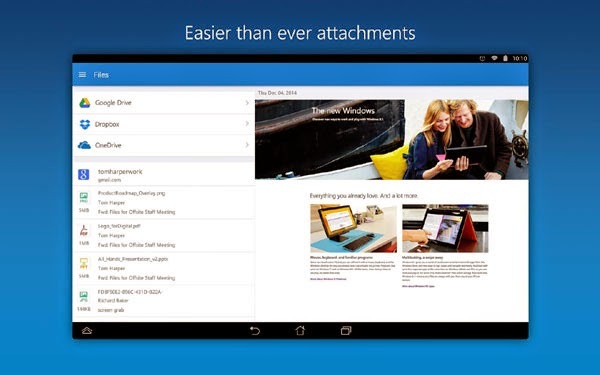 And attach files from your email, OneDrive, or Dropbox with just a few taps. + Outlook automatically triages your inbox for you, surfacing your most important email. Less relevant email is placed in your "Other" inbox. + Swipe to quickly delete, archive, or schedule messages. + Schedule emails and they will return to your inbox at a later time. + Switching between your email and calendar apps is a thing of the past. Outlook includes your calendar and notifies you with appointment reminders. + Find available meeting times and share them in email or schedule a meeting. + View and attach any file from your email, OneDrive, Dropbox, and other accounts with just a few taps. + Send large files even if you haven’t downloaded them to your phone. + Filter your inbox to only show messages that are unread, flagged, or have attachments, with a single tap. + Quickly find the right messages, people and files by typing just a few letters. + Outlook shows people you communicate with most often, and lets you conveniently drill down to see all related emails, meetings and files. 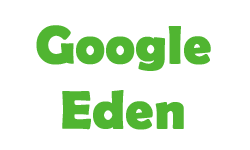 GoogleEden = Android + Chrome!